How do I control this traditional light fitting via DALI? A persistent headache in this industry has been how to control a traditional dimmed luminaire via a DALI system? The Diginet DALI Adaptive Phase Angle Dimming Device provides an answer. It’s an ‘out of the box’ solution designed for those situations when you need to get ‘out of trouble’ without incurring huge investment in time or money! Use in situations where you need to control a traditional dimmed luminaire via a DALI system. Being fully DALI compliant this device will work on any DALI network regardless of the manufacturer. It is suitable for LED lighting as well as traditional light sources so can also be used in conjunction with load correction devices where LEDs are causing issues with flickering. 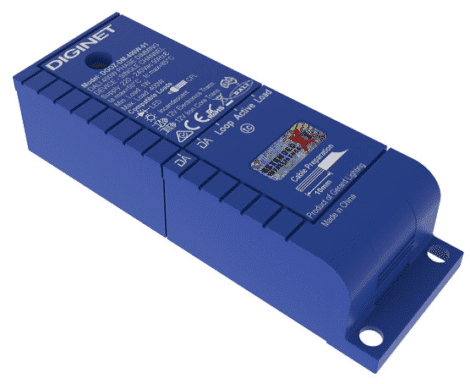 Designed for dimming up to 400W of connected lighting via DALI commands issued on a connected DALI line. Not suitable for HVAC or any motor loads.